We love all our customers (parents, students, tutors), and we love our colleagues; with love comes passion and perfection. We strive to create win-win situations for everyone parents, students, teachers and tutors. Ace Tutors, an online tuition agency business, strives to provide the most lasting and effective match between students and tutors. Parents want coordinators who they can trust to be professional and transparent with, and tutors want coordinators who provide timely and trustworthy service. With that clear understanding of these needs, Ace Tutors was born in 2008. With your continued support and love, we have managed to grow and continually improve to serve you better; to help make the search for your ideal match easier and faster. Your very encouraging and constructive feedback has given us faith to invest more in our people and our technologies; so that we stand an even greater chance of delighting you. Thank you and stay awesome. Be sure about what to look out for before you engage a private tutor. Read these no matter how busy you are. It can definitely help you save some cash and time and perhaps secure a tutor who can stay with you for the long haul. A tutor, as a matter of qualifying criteria, should have certification in the teaching subject of at least 1 level higher than the level that he/she is teaching. This would allow the tutor to generate deeper and more interesting insights to the students in his teaching. The tutor will also be able to impart invaluable study strategies and mental shortcuts in dealing with the subject matter. To ensure that tutors can effectively value-add to the learning process, it would be most appropriate that the tutor is currently engaged in a profession or course of study that is related to the subjects taught. Be careful not to mistake a tutor in the accounting profession to be good with Additional Mathematics (A maths) or Junior College (JC) Maths; accounting may be mathematical in nature but it does not entail the complex concepts in higher level Mathematics. Balancing the cost of hiring the tutor against his/her quality and commitment can be a tricky task. Finding the �cheapest� tutor around may not be as marvelous a bargain as you might think; although it may be true in some cases (you are really blessed!). Some tutors charge low prices out of compassion for their students or because of the passion they hold for teaching. We are constantly looking out for these dedicated teachers. When we find them, we rank them highly in our system and we constantly recommend them to other parents and students. They normally have few slots left in their schedule owing to their popularity, so it might be a matter of sheer luck and persistence that Ace Tutors can grab them for our students when these teachers finally have freed up time. On the other hand, high tuition fee does not necessarily mean a high quality of tuition or commitment. Some tutors may quote high prices for a variety of reasons. These usually range from their academic credentials, teaching credentials, experience to their personal wage expectations. We are wary of tutors with little experience but who quote above-average rates for inappropriate reasons such as merely high level of academic qualifications. It is understood that good academic results do not necessarily equate to great teaching. We encourage new tutors with little experience to accept slightly lower rates first. Only when they are more seasoned and confident then should they charge higher tuition fees. This is also more equitable to parents/students. You can easily differentiate tutors with high levels of passion from all the �extras� they invest in their students and the students� parents: they don�t mind leaving later than the scheduled lesson time, they plan their lessons well and deliver lessons enthusiastically, they may sometimes try new methods of teaching to engage unmotivated students, they introduce educational games to students which students play in their spare time, they reward students with sweets or other surprises bought out of their own budget, they prepare special sets of notes in their free time for students who need it, they plan academic and life goals with their students and guide them towards achieving it, they give regular feedback to parents on the progress of their students, they advise parents and urge them to reinforce good behavior in students, etcetera. Of course, few tutors may exhibit all these sets of qualities, although we know of some. How you, as a parent or student, may spot such qualities in tutors is by reading their profile descriptions or reading the comments provided by other parents/students regarding these tutors. Ace Tutors keeps track of these positive feedbacks from our clients and rates our tutors accordingly. You may look out for the "Good" or "Excellent" badges on tutors� profiles when you do your search. The rich experience of a seasoned tutor enables him to spot the exact problems in students immediately and administer the correct and most effective remedy. Provided that other fundamental factors are in place, such as the student is motivated to learn or that there is positive reinforcement by parents, this normally translates into vast improvement in the child within 4-8 lessons. When assessing tutors it is important that you look out for the right set of experience in them. A tutor who has vast experience with secondary school students may not know how to handle a lower primary level student, especially when he starts running around from restlessness! Similarly, a tutor experienced with primary level students may not be attuned to the psychology of International Baccalaureate (IB) students. Should such information not be adequately available based on the tutor�s profile, we will clarify with our tutors personally and update our clients before any recommendation is made. Furthermore, we allow parents to communicate directly with our tutors to assess them in greater detail, until the most suitable candidate is found for the tuition. Make sure that the tutor you are engaging does not have work or study commitments in the near future which may disrupt the tuition. Some undergraduate tutors may have study exchange programs for which they need to leave the country for 3-6 months. Others may be planning an unexpectedly long holiday of 1-2months after the first few lessons. Ace Tutors will check the availability of its tutors in the next 6-12 month period before recommending any of them to you. When everything else is in place, be sure to verify the academic and teaching qualifications as stated by the tutor. 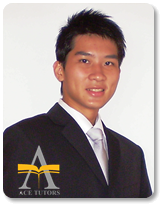 An honest tutor will not hesitate to show you his/her certificates on the first session of tuition. For tutors who have "Verified" badges on their profile, be assured that Ace Tutors have checked and confirmed the validity of the certificates provided our tutors. In any case, Ace Tutors requires all its tutors to furnish their paper qualifications on the first lesson. Should this not be done, kindly inform us and we will take the appropriate actions.